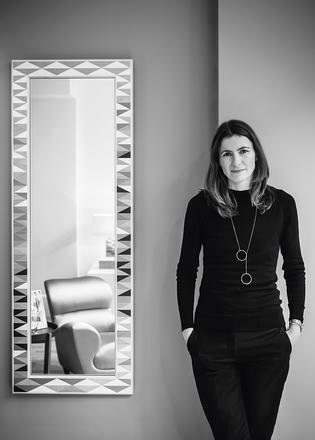 She may have arrived only last October but Carmel Allen, the new creative director of Linley, has already set big plans in motion. Its flagship, in Pimlico, London, is about to undergo stage one of a revamp, which will see it transform into an eclectic blend of shop and gallery, just as it was when Linley first moved to the area. “It’s going to have a workshop and gallery and, hopefully, a café. It’ll be much more dynamic, much more lively and much more of a mix,” says Allen proudly. And the designers will have an open studio in full view on the mezzanine, “so design will be right back at the heart of the store”. The company celebrates its 30th anniversary this year and, while bespoke furniture is still a key part of its business, retail, interiors and, of course, yacht design are now equally important. Linley himself is still very much involved and stays in regular contact with Allen, sending photos from his iPhone of ideas for new pieces from far-flung corners of the globe where he’s visiting clients. The shelves of the Pimlico store are lined with beautiful frames, fabulous crystal, and wooden boxes exquisitely designed with maps, cityscapes, geometric lines and the Union flag, all made by hand using wood and resins and showing off the craftsmen’s mastery of marquetry. Linley has a box for everything, be it the very large burr and ripple-maple jewellery box that’s a scaled interpretation of Highclere Castle of Downton Abbey fame, or a walnut and sycamore box bar, complete with decanters, tumblers, cigar cutters and ashtray. The designs may be classic, but there’s plenty of room for vice. There is no central Linley workshop; instead, it relies on a network of highly skilled craftsmen and women around Britain to handmake its intricate furniture and other elegant items. Allen is keen to dispel the myth that makers slave away in workshops knee-deep in wood shavings. 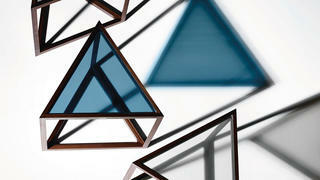 “They’re really meticulous and their ateliers are almost like laboratories. It’s all about precision and attention to detail.” When Linley started out, all the wood was cut by hand; now, lasers are used for precision and also to create exciting textures, such as marquetry that looks like snakeskin or alligator print. The company is at the forefront of innovation, not only when it comes to laser etching but also many other techniques. 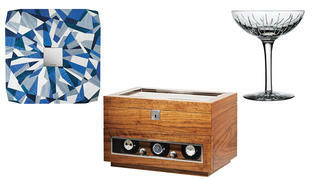 The Dusk Cocktail Console in the Lightscape collection, for example, uses electromagnetic technology to levitate its drinks tray in mid-air. It’s worthy of Harry Potter. One of the key initiatives for the firm’s 30th-anniversary year is the launch of the Linley School of Furniture – a summer school led by William Warren, senior lecturer at the Sir John Cass Faculty of Art, Architecture and Design. It will redress an important balance. “Most of the UK’s degree courses in design, 3D design and furniture-making are giving very little time to workshop time. A lot of it is done behind computer screens,” says Allen. Indeed, many of the traditional colleges, such as Linley’s beloved Parnham, have closed and “the Cass” itself is under threat. It’s clear legacy is held dear at Linley. In her quest to fuse the old and new, Allen has tracked down some of David’s original pieces, which include a cigar-and-cigarette box he made for his aunt, the Queen. One of his first screens, of Venice, will also return to the store.